Plywood of highest quality (Birch tree) is mainly used for the products. The quality of the raw-material used is very important since a part of the articles are varnished with clear varnish which make the surface of the product visible. Larger shelves are made from boards of high quality pine wood. 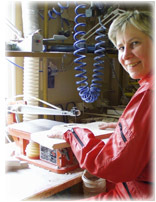 To be able to scroll saw complicated patterns, you have to make a drawing at first and then transfer the pattern to the piece of plywood. If you want to make a lot of similar things, it might be a good idea to make some models in plywood and just draw with a pencil around and inside the model such transfering the pattern to the material to be used. During the years some machines have also been bought; like plane machine, scroll-saw machine, lathe, circular saw, grinding machine and a compressor for pneumatic tools. Furhermore a lot of hand tools are used. 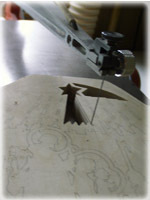 An electrically heated pen and a turbine pen are used for engraving names in signs made of wood or plywood.